Why does a company need to integrate organic search? Organic search offers a tremendous return on investment. According to Brad Fallon and Andy Jenkins organic search gets 250% more clicks than PPC (Pay Per Click) advertisement. People and search engines place significantly more weight on organic listings. Organic listings have more credibility because you have to earn a top spot. You cannot buy your way to the top like PPC listings. The example to the right gives an excellent indication of how people view SERPs (Search Engine Result Pages). The areas highlighted in red get the most attention. Notice that people focus on the top organic listings and pay little attention to the PPC ads. SEO is NOT a "fire and forget" tactic. You need to constantly tweak your approach. There are no easy paths. Organic SEO also needs to be combined with great web strategy, strong design, smart marketing, and usability. Those companies that can combine all those features do very well online. You need to give organic SEO serious consideration if you want to be successful online. 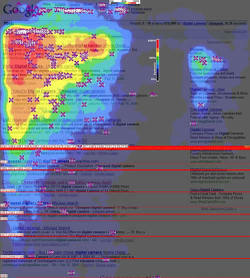 Google Heatmap image courtesy of brandinfection.com.